Looking for Indoor Pools in Surrey? A number of of them belong to gyms or sport centers which also offer lessons. The finest pools to swim are undoubtedly indoor olympic pools. Thanks to some new Swimming Pools submitted every day, Swimia.com is increasing everyday the number of stored pools. Please don't hesitate to contact us for those who find any inaccurate or incomplete facts. Please contact the facilities to check which activities are offering and their timetables. Swimming is actually a sport for all ages. It assists young consumers to tone their muscles and grow healthy and strong. 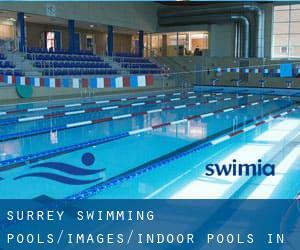 Please check the nearest Indoor Pools in Surrey or Contact us to ADD IT. It is free of charge! Without a shadow of a doubt, swimming in Reigate may be the very best option to unwind following work. Take a couple of minutes to browse Swimia's catalog to find a Pool in Reigate. It's difficult to visit Surrey without dropping by Woking (with 103.932 residents). Currently Swimia is showing you all the Swimming Pool in Woking and the closest pools located in its vicinity. Swimming is a terrific idea to keep your body active during your visit to Guildford (Surrey), or perhaps in case you are a local. Swimia helps you to find your closest Pool in Guildford. Holding an estimated population of 52.392, Esher is one of the most important cities in Surrey. Check all the Swimming Pool in Esher and its surrounding area. Let us tell you a secret to switch off whilst you are in Staines: just choose a Swimming Pool in Staines and plunge into the water! There's no additional successful technique. Whereas Redhill is one of the six most populous cities in Surrey with almost 51.559 residents, you shouldn't miss that one if you're going to Surrey. London Road , Bagshot , England , UNITED KINGDOM (Postal Code: GU19 5EU). This sports center offers 25 meters x 10 meters, Indoors. For this Swimming Pool, only phone number is number here. Updated on 2019 Windsor Road , Egham , England , UNITED KINGDOM (Postal Code: TW20 0AG). Among all the activities offered by the center, if you are interested in swimming you will enjoy 18 meters x 4 meters, Indoors. If you need to contact this Swimming Pool, e-mail address and phone number are both number. Little Street off Railton Road , Guildford , England , UNITED KINGDOM (Postal Code: GU2 9JX). Among all of the activities supplied by the center, when you are interested in swimming you can expect to take pleasure in 20 meters x 8 meters, Indoors. If you need to contact this Swimming Pool, email address and phone number are both number. Petworth Road , Haslemere , England , UNITED KINGDOM (Postal Code: GU27 3BQ). Swimmers like you reported 16 meters x 8 meters, Indoors. Phone number and e-mail address are number for this Swimming Pool. Arthurs Bridge Road , Horsell Moor , Woking , England , UNITED KINGDOM (Postal Code: GU21 4NT). This sports center gives 18 meters x 8 meters, Indoors. Contact information for this Pool including phone number and email address are number. Weston Drive , Caterham , England , UNITED KINGDOM (Postal Code: CR3 5XY). Among all the activities offered by the center, in case you are interested in swimming you will enjoy 20 meters x 9 meters, Indoors. If you will need to contact this Swimming Pool, email address and phone number are both number. The Crescent , Leatherhead , England , UNITED KINGDOM (Postal Code: KT22 8DY). Among all the activities offered by the center, if you are interested in swimming you will delight in 20 meters x 8 meters, Indoors. Just in case you need to get in touch with this Swimming Pool just before dropping by, we only know the phone number. The Leisure Complex , Parkway , Guildford , England , UNITED KINGDOM (Postal Code: GU1 1UP). Swimmers like you have reported 25 meters, Indoors. Also, you will find 18 meters x 10 meters training pool, Indoors. If you might want to contact this Swimming Pool, email address and phone number are both number. Updated on 2019 Kingfield Road , Woking , England , UNITED KINGDOM (Postal Code: GU22 9BA). This sports center gives 25 meters, 6 lanes, Indoors. Contact information for this Pool including phone number and email address are number. Westfield Avenue , Old Woking , Woking , England , UNITED KINGDOM (Postal Code: GU22 9PF). Among all the activities offered by the center, in case you are interested in swimming you will enjoy 20 meters x 10 meters, 3 lanes, Indoors. Just in case you would like to contact this Swimming Pool before dropping by, we only know the phone number. Pyrford Road , Woking , England , UNITED KINGDOM (Postal Code: GU22 8UQ). This sports center provides 20 meters x 7.5 meters, 4 lanes, Indoors. For this Swimming Pool, only phone number is number here. Grand Avenue , Camberley , England , UNITED KINGDOM (Postal Code: GU15 3QH). Swimmers like you reported 25 meters, 1 meters - 1.75 meters depth, 1 meters - 1.75 meters depth, Indoors. Unfortunately we do not have the email address of this Swimming Pool, but we can give you the phone number. Broadwater Park , Summers Road , Farncombe , Godalming , England , UNITED KINGDOM (Postal Code: GU7 3BH). Among all the activities offered by the center, if you are thinking about swimming you can enjoy 25 meters x 11.5 meters, 6 lanes, 0.9 meters - 3 meters depth, 0.9 meters - 3 meters depth, Indoors. Just in case you wish to make contact with this Swimming Pool before dropping by, we only know the phone number. Dogflud Way , Farnham , England , UNITED KINGDOM (Postal Code: GU9 7UD). This sports center offers 25 meters, 6 lanes, 1 meters - 1.85 meters depth, 1 meters - 1.85 meters depth, Indoors. For this Swimming Pool, only phone number is number here.